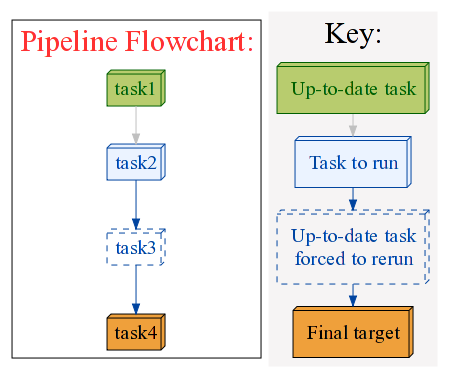 Computational pipelines, especially in science, are best thought of in terms of data flowing through successive, dependent stages (ruffus calls these tasks). Traditionally, files have been used to link pipelined stages together. This means that computational pipelines can be managed using traditional software construction ( build ) systems. However, make and GNU make use a much criticised specialised (domain-specific) language. The make language has poor support for modern programming languages features such as variable scope, pattern matching, debugging. Make scripts require large amounts of often obscure shell scripting and makefiles can quickly become unmaintainable. Many attempts have been made to produce a more modern version of make, with less of its historical baggage. These include the Java-based Apache ant which is specified in xml. More interesting are a new breed of build systems whose scripts are written in modern programming languages, rather than a specially-invented “build” specification syntax. These include the Python scons, Ruby rake and its python port Smithy. The great advantages are that computation pipelines do not need to be artificially divided between (the often second-class) workflow management code, and the logic of real calculations and work in the pipeline. It also means that workflow management can use all the standard language and library features, for example, to read directories and match file names using regular expressions. Ruffus is much like scons in that the modern dynamic programming language python is used seamlessly throughout its pipeline scripts. Although Python scons and Ruby rake are in many ways more powerful and easier to use for building software, they are still an imperfect fit to the world of computational pipelines. This is a result of the way dependencies are specified, an essential part of their design inherited from GNU make. The order of operations in all of these tools is specified in a declarative rather than imperative manner. This means that the sequence of steps that a build should take are not spelled out explicity and directly. Instead recipes are provided for turning input files of each type to another. So, for example, knowing that a->b, b->c, c->d, the build system can infer how to get from a to d by performing the necessary operations in the correct order. The same recipe can be re-used at different points in the build. Intermediate files do not need to be retained. Given the automatic inference that a->b->c->d, we don’t need to keep b and c files around once d has been produced. The disadvantage is that because stages are specified only indirectly, in terms of file name matches, the flow through a complex build or a pipeline can be difficult to trace, and nigh impossible to debug when there are problems. Ruffus takes a different approach. The order of operations is specified explicitly rather than inferred indirectly from the input and output types. So, for example, we would explicitly specify three successive and linked operations a->b, b->c, c->d. The build system knows that the operations always proceed in this order. Looking at a Ruffus script, it is always clear immediately what is the succession of computational steps which will be taken. Ruffus values clarity over syntactic cleverness. GNU make, scons and rake work by infer a static dependency (diacyclic) graph between all the files which are used by a computational pipeline. These tools locate the target that they are supposed to build and work backward through the dependency graph from that target, rebuilding anything that is out of date.This is perfect for building software, where the list of files data files can be computed statically at the beginning of the build. Though the stages of a pipeline (i.e. compile or DNA alignment ) are invariably well-specified in advance, the number of operations (jobs) involved at each stage may not be. A common approach is to break up large data sets into manageable chunks which can be operated on in parallel in computational clusters or farms (See embarassingly parallel problems). This means that the number of parallel operations or jobs varies with the data (the number of manageable chunks), and dependency trees cannot be calculated statically beforehand. Rake dependencies unknown prior to running tasks. Ruffus explicitly and straightforwardly handles tasks which produce an indeterminate (i.e. runtime dependent) number of output, using a split / transform / merge idiom. Ruffus manages pipeline stages directly. The computational operations for each stage of the pipeline are written by you, in separate python functions. The dependencies between pipeline stages (python functions) are specified up-front. These can be displayed as a flow chart. Ruffus makes sure pipeline stage functions are called in the right order, with the right parameters, running in parallel using multiprocessing if necessary. Checkpointing automatically determines if all or any parts of the pipeline are out-of-date and need to be rerun. Separate pipeline stages, and operations within each pipeline stage, can be run in parallel provided they are not inter-dependent. Another way of looking at this is that ruffus re-constructs datafile dependencies dynamically on-the-fly when it gets to each stage of the pipeline, giving much more flexibility. Are there any disadvantages to this trade-off for additional clarity? Each pipeline stage needs to take the right input and output. For example if we specified the steps in the wrong order: a->b, c->d, b->c, then no useful output would be produced. Intermediate files need to be retained. Re-use of recipes is as simple as an extra call to common function code. Finally, some users have proposed future enhancements to Ruffus to handle unnecessary temporary / intermediate files. A comparison of more make-like tools is available from Ian Holmes’ group. There are also complete workload managements systems such as Condor. Various bioinformatics pipelines are also available, including that used by the leading genome annotation website Ensembl, Pegasys, GPIPE, Taverna, Wildfire, MOWserv, Triana, Cyrille2 etc. These all are either hardwired to specific databases, and tasks, or have steep learning curves for both the scientist/developer and the IT system administrators. Ruffus is designed to be lightweight and unintrusive enough to use for writing pipelines with just 10 lines of code. Bruce Eckel’s insightful article on A Decorator Based Build System was the obvious inspiration for the use of decorators in Ruffus. Ruffus tries to have minimal impact on the functions it decorates. Bruce Eckel’s design wraps functions in “rule” objects. Ruffus tasks are added as attributes of the functions which can be still be called normally. This is how Ruffus decorators can be layered in any order onto the same task. Languages like c++ and Java would probably use a “mixin” approach. Python’s easy support for reflection and function references, as well as the necessity of marshalling over process boundaries, dictated the internal architecture of Ruffus. The Boost Graph library for text book implementations of directed graph traversals. Andreas Heger, Christoffer Nellåker and Grant Belgard for driving Ruffus towards ever simpler syntax.